Loosely based on events in the American intelligence community during the Reagan administration, FIRE tells the unique and powerful story of a young man's journey from quiet college student to the complex world of international intelligence. 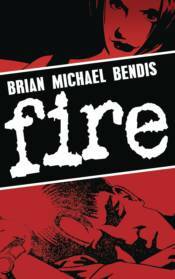 From crime noir master Brian Michael Bendis comes this now-classic tale in an all-new edition! Imagine that you are a shy, quiet college student. Just an average guy trying to get through each day as best he can. Then your government contacts you. They want you to be part of an experiment in the art of human covert operations. Instead of creating an agent from someone within their own ranks, they want to create an agent from nobody, from scratch, from you! This definitive presentation of Eisner Award winner Brian Michael Bendis' first cinematic noir comic features re-mastered art and lettering, plus a newly revised script.